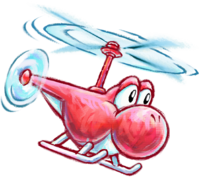 Helicopter Yoshi, also known simply as the Helicopter, is a form the Yoshis can transform into in the Yoshi franchise, often by touching a Morph Bubble with its picture inside. Helicopter Yoshi first appears in Super Mario World 2: Yoshi's Island in the level Watch Out Below!, where the player transforms into this form by touching a Morph Bubble. In this form, the player can fly around the level until they reache the Yoshi Block or until there time as a helicopter runs out. As with other transformations, the latter sends him back to the position where the Morph Bubble was touched. The Helicopter can be controlled with the D-pad. Touching an enemy while in this form makes the Yoshi fall a short distance, unable to be controlled, which can cause the player to lose time and a life if they fall into a pit. Helicopter Yoshi reappears in Yoshi's Island DS, functioning the same as it did in Super Mario World 2: Yoshi's Island. Helicopter Yoshi reappears in Yoshi's New Island, acting the same as it did in Super Mario World 2: Yoshi's Island, although the player now transforms into this form by entering a Whirly Gate instead of a Morph Bubble and controls the helicopter by tilting the system. In volume 14 of the Super Mario-Kun, Yoshi eats a Morph Bubble and turns into the Helicopter. He carries Mario and Luigi; Mario then makes the Helicopter eat a Watermelon. This causes the Helicopter to spit seeds at Kamek, the Toadies, and even Baby Mario who was getting carried by the Toadies in the process. Unlike in the games, the Helicopter runs on a timer and ends whenever, causing Mario, Luigi, and Yoshi to fall to the ground. Helicopter Yoshi makes a cameo in Mario Kart: Double Dash!! in the tracks Yoshi Circuit and Baby Park, where it appears flying over both tracks, and it appears on Yoshi Circuit's icon in the menu. The Yoshi Circuit track in Mario Kart DS removes the helicopter altogether, while in Mario Kart 8, it is rebranded into being a Mario Kart TV themed helicopter. Helicopter Yoshi reappears in Mario & Luigi: Paper Jam, where it appears as a LV 2 Battle Card that raises the character's Speed by 35% for a limited time when used. Eliyoshi (Yoshi's Island: Super Mario Advance 3 manual only) Compound of elicottero (helicopter) and Yoshi. The Helicopter is one of the two forms of Yoshi that appear in all three Yoshi's Island games, the other being the Submarine. This page was last edited on January 7, 2019, at 19:06.